•	Vortexers, or orbital mixers. Rotators are equipped to spin sample tubes in a continuous 360° motion around a pre-determined orbital axis. The disc of a rotator typically enables the secure attachment of multiple test tubes of varying sizes, enabling researchers to simultaneously observe the conditions of varying analytes under identical experiment conditions. A rotator is primarily used to mix samples, providing variable speeds and good degrees of process automation for laboratories of varying throughputs. The continuous motion of a rotator effectively agitates the particles within a sample flask or tube, preventing agglomeration of nanoparticles, proteins, or fatty cells in emulsions. This fully-tunable range of motion also reduces the potential formation of precipitates from dissolved solid particles. 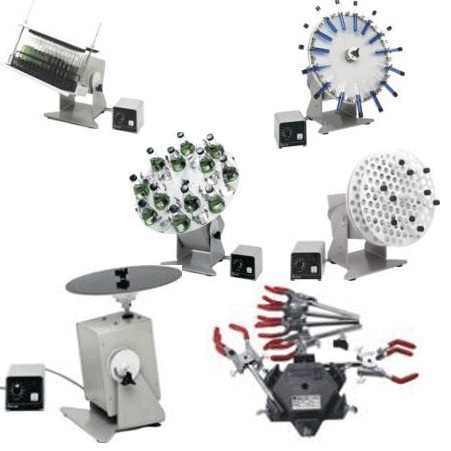 Rotators are routinely used for all manner of laboratory mixing applications, including embedding electron microscopy, creating blood cell suspensions, encouraging tablet disintegration, and washing precipitates in solvent solutions. •	A pepsin digestibility rotator that is suitable for rotation within an incubating environment to study digestion of proteins under agitation in temperature sensitive environments. Glas-Col is a leading supplier of laboratory equipment for small, medium, and high-throughput research environments. We source, develop, and supply a robust range of laboratory mixers for distinct applications, including a diverse range of rotators for various scientific applications. If you would like any more information about our range of rotators or any other products, please do not hesitate to contact us.